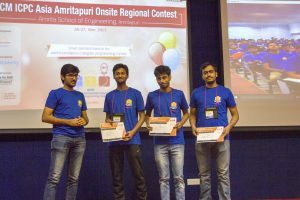 Amrita Schools of Engineering at Amritapuri & Coimbatore has been hosting the most prestigious International Collegiate Programming Contest for the past 11 years. This year’s Onsite Contest is scheduled on December 28 – 29 at Amrita School of Engineering, Amritapuri & Coimbatore campuses. Number of slots: 250. Selection of teams is according to the rank and those who have solved most number of problems are given priority. There will be a cap on maximum number of teams selected from one single institution. Onsite fee payment shall be made on or before 20th of November 2018. 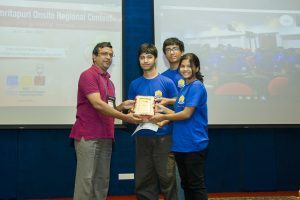 Teams who wish to change the members are required to send the team member name and email id to icpc[at]am.amrita.edu. Enter Your Site Preference Here – Only one member in a selected team needs to enter the details.Please avoid the duplication and enter your online contest id in full format like acm18in…. Note: Please enter the site willingness before 10th November 2018(Saturday) evening. The payment link for onsite registration will be live on Monday onwards. 1. Complete the team profile in Baylor Site: Profile of all the team members in Baylor Site shall be completed in all respects. If there is a change in the member details in the team, it has to be done prior to December 1, 2018. 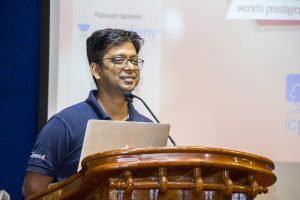 Teams are ‘promoted’ from Asia Amritapuri Online Contest to ‘Asia Amritapuri Doublesite Contest’ in the Baylor Registration System. Buses will ply from Coimbatore Bus stand / Coimbatore Railway Station / Kayamkulam Railway Station / Kayamkulam Bus Stand.Teams are required to update the travel plan one week ahead of the date of the event. Start your Traveling Plan to Onsite: CLOSED (If there is any doubts regarding the arrangements of transportation, please contact concerned person of transportation . The site wise transportation in charge persons contact number is updated in this same page under “Site Wise Contact Details”). Accommodation for ICPC Participants will start on 27th morning onwards. Teams shall complete their details of arrival and departure in the portal. Link will be published in the website amrita.edu/icpc after December 1st. For the detailed information about the ICPC onsite round in Ettimadai, participants can use this site. Participants can start enter their travel plans in respective site.